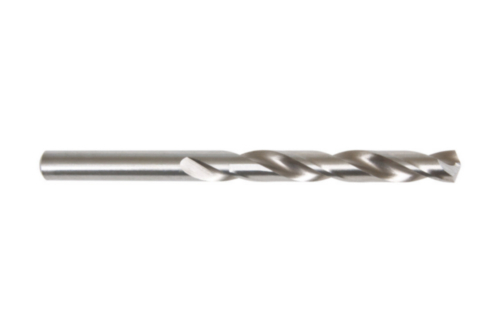 Precision spiral drill bit made of high-grade high-speed steel according to DIN 338, precision ground, cylindrical, right-hand cutting, type N, crosswise grinding 135° according to DIN 1412 C (from 3 mm), diameter tolerance h8 Bare surface For highest demands and precision in industry and crafts. For drilling steels, cast steel, alloyed and unalloyed, grey cast iron, tempered cast iron, ductile cast iron, sintered iron, nickel silver, graphite NF metals, plastic. Up to 900 N/mm² tensile strength.